72 registered members (Alan_nc), 412 guests, and 272 spiders. I've run into another problem with this Spitfire that I need guidance on. I always thought that in 1967, only two bikes came with the then new Concentric carbs, the '67 BSA Spitfire and the Norton / Matchless P11's. My 1967 BSA A65 parts book shows only the GP2 carbs for the Spitfire and the monoblocks for everything else. The '66 BSA A65 parts book only shows monoblocks across the entire A65 range. My unmolested '67 Spitfire has the Concentrics. I am assembling a '66 Spitfire now and need to know what is correct. I know I have the correct books because the Spitfire prefix for '66 is A65S and the '67 model shows A65SA. Where can I document what's correct? Also did any Spitfires (or Gold Stars) ever come with Borrani rims or Dunlop alloys only? Not an expert on the unit models but I believe the '66 Spitfire would have come with the GP's and Dunlop or Borrani, or even Jones steel rims. As far as what bikes and when the Concentrics showed up on I have a pretty original late '67 Bonneville that has Concentrics. The Concentrics were popular replacements for the troublesome GP's. Concentrics also showed up on 1967 B44 Victor Specials. Yep, GPs for the 1966 Spitfire Mk II, if you can get hold of them. Otherwise, use the 932 Concentrics. The 1967 Spitfire Mk III had 932 Concentrics. Further observations: the rear wheels, whether Borrani or Dunlop, were WM3 18. The front 190mm brake had the backing plate polished unlike the Gold Star that had a hammertone paint finish. I have a couple of WM3 18 Dunlop alloy rims that have the A50/65 rear hub so I'm assuming they were from a Spitfire. I also have a Borrani that I use on my '59 Gold Star vintage racer, without the unit hub though. BILL, I AGREE WITH WHAT YOU SAY REGARDING THE RIMS BUT EVERY UNMOLESTED 66 SPITFIRE I HAVE SEEN INCLUDING THE ONES I REMEMBER SEEING IN THE SHOWROOMS BACK IN 66 HAD A HAMMERTONE PAINT FINISH ON THE FRONT BRAKE. 1966 Spitfires came with GP carbs. This doesn't mean that a 66 Spitfire wasn't refitted with Concentrics or even Monoblocs carbs by the dealer or a previous owner, as the GPs are a bit fussy to tune and ride. Most every GP I have seen is worn out, which makes using them even more problematic. Do yourself a favor, fit a nice pair of rebuilt Concentrics or Monoblocs, both will give good results, and avoid a lot of hassles. 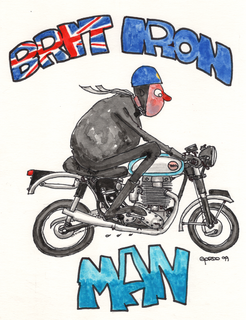 Having them on a 1966 Spitfire, in my mind, wont detract from the bikes pedigree as they were used on the later year models anyway. Spitfires came with either Dunlops or Borrani rims. I don't know about what Shane in Oz says about the front being a Dunlop and the rear a Borrani, but considering the cavalier way the British factories were operated at the time anything is probable. I believe both are to be considered correct. This bike came to me years ago as a rolling, 80% complete basket case, so I don't know all the correct details for the '66 model. As I said earlier, my '67 Spitfire is correct in every detail that I can see. When I restore a bike, I want it technically correct in every detail if possible. I have the correct carb / remote assembly hanging on the wall, so that's not a problem. This bike came with a Dunlop alloy rim on the back and a Borrani on the front (my '67 has Dunlops on both ends). Several of you said the Brits sometimes used Borrani's if I'm reading you correctly. Did they use two different brands on the same bike or was one of these switched? Where can I find documentation to back this up. My '66 came to me as a mess. It is pretty nice now. It is a late '66 after the frame and engine numbers began matching. It has the stock GP's. Runs very nicely with them. At idle its a bit like the old days when we all had clapped out carbs, but once you are moving they are fine. BSA had a number of bulletins on making the GPs work. The one that did it for mine was a special set of cables that allow you to lift the slide for an idle, but still have free play from the throttle. Mine has Dunlop alloys front and rear. 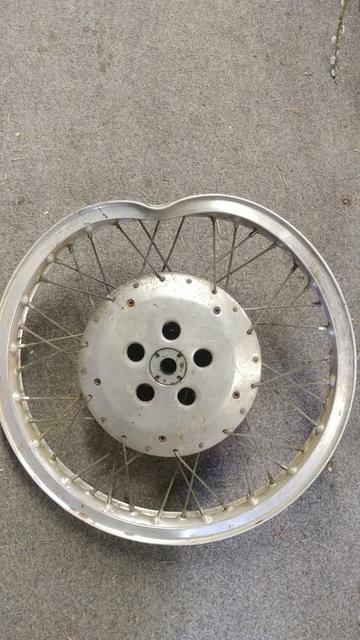 My understanding, which may very well be wrong, is that at some point, Dunlop either stopped making alloy rims, or BSA simply ran out of them, and BSA started using Borranis. I also understand that there are, and were, plenty of mixed sets out there. The front brake backing plate is polished, but the primary side of the hub has the hammertone finish (mine slid down the road at one point, the finsh on the left side of the hub looks like it actually was done with a hammer!). One thing that is different on the '66s is the brake/choke levers. They use regular chrome levers. The alloy levers didn't start till '67. Mine is generally stock. I have 9-1 pistons instead of the 10-1s. I have a slightly warmer cam (more on that later), 6ca points and advance and a solid state regulator/rectifier. My original fiberglass tank is on the shelf while a pretty nice Indian steel replica sits on the bike. NJB shocks in the rear. When I got the bike it had been sitting for 40 years with a purple paint job, no compression with a 9-1 piston on one side and a 10-1 on the other. When I got it going it had very little power and it took me quite awhile to figure out why. Turned out it had a bad cam from the factory. The primary side opened 40 degrees late and closed 20 degrees early. The problem was compounded by the previous owner installing GP6 needles (the lean ones for megaphones) to try and cure the problems. Once I figured that out and put in the new cam and correct needles, it ran great! Alloy rims were an optional extra, you probably got what was available to the factory at the time, also , theres every chance a wheel has been rebuilt at some point in its life with whatever was available. To the untrained eye Borranis are the same as Dunlops, the trained eye picks out the slightly larger flange of the Borrani, Bs are very strong, I dont know if Dunlops are as strong, but I have bent two sets of forks with my front B and its still straight. I wouldnt hesitate to fit one. They are difficult to persuade rubber onto , but well worth the bother. Browsing "BSA A65 Spitfire" on Google today, shows several '66 Spits with hammertone-painted front brakes. Maybe only some of the early '67 Spits were painted, and the rest polished? The information on Dunlop vs.Borriani rims is interesting, as I formerly believed ALL were from Dunlop. Years ago I bought a '67 Spitfire cheap so I could steal the front Dunlop alloy rim for my Goldstar. It had Dunlop rims front and rear. When it came time to dispose of the Spitfire I researched specification. There were articles published in Cycle World and other bike mags when the new models debuted each year which describe the significant changes from the previous year. As I recall, the significant changes mentioned in Cycle World for the MK 111 Spitfire were the points plate and the then new Concentric carburetors (Concentrics # 1 and 2 I believe). Borrani rims are stronger than Dunlop. Akront are stronger yet. I saw Dunlop alloys that came off a dirt bike once and they were badly dented. Years ago I bought a complete 190mm brake front wheel ($30) and it had a Borrani on it. It was a 'Borrani WM 2-19 Record' rim. On the inside of the rim it is stamped 42-5905 which I believe is an A65 part number. ALLOY RIMS WERE NOT OPTIONAL ON THE SPITFIRE, THEY WERE STANDARD EQUIPMENT. You have me beat - I paid $50.00 for the 190MM front brake with Dunlop alloy rim on my Gold Star in the mid to late '80's. That's all they were worth then. I can't say I agree with your "Without frequent roadside repairs there is no fun in riding! " 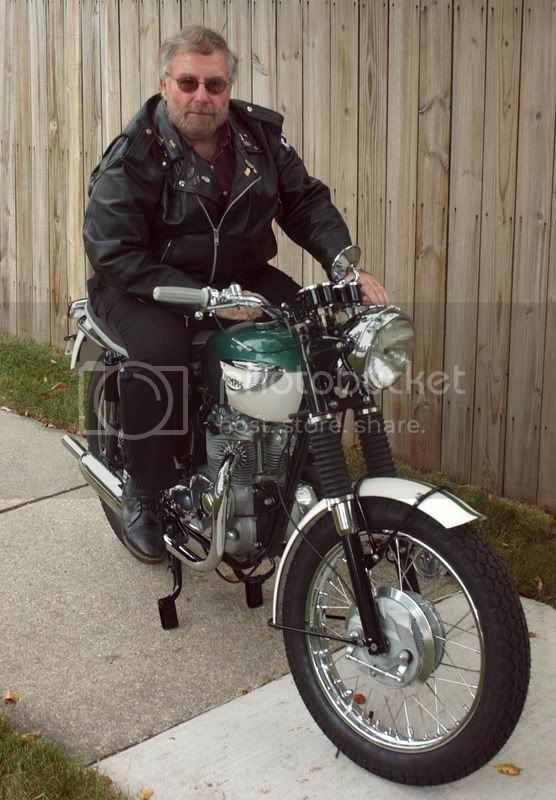 Hello Spitfire Ken, i remember back in 1972 buying a BSA with GP carbs completely stock for $ 500.00. Ohh boy i sure wish i could turn back the clock .Of course i heard about it through a friend of a friend, Now i Grabbed a 1966 650ss Norton (stock unaltered) for $ 800.00 & a 90% complete 1966 T120R (in parts) for $300.00 & once again that was years ago & i still gotem, i guess once i was introduced to British Bikes it stayed in my blood with showing no signs of ever leaving.But with the change of time, so do we , But none the less something's are always unforgettable. British Cycles are among the top. 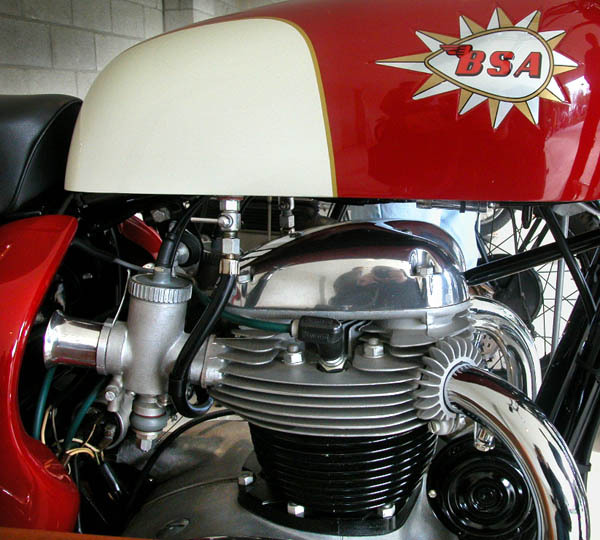 WHAT YEAR AND MODEL BSA DID YOU BUY BACK IN 1972? Past: 4 x 1976 T160V, 1 74/5 T150V, 83 model GSX 750 ESD, Z650, Katana 1100(Bathurst Model), 79 T140V, 70's TR6, 2 x 1971 BSA 250 Gold Stars, 50's 350 Goldie, A65 Spitfire semi basket case, 1965/6? A65 LC, Tiger 21 350 & a D14/4 Bantam, 175 Bridgestone Twin with Zimmerman discs! Sorry I got that wrong about the optional extra, Spitfires had alloys , probably the front had a shunt and got replaced with what was available. Borranis are a good next best thing, possibly better. Alloys were available for other models as an option. 66 Spitfire is a Mk 11 and would have GP carbs. The Mk 111 , 67, had 930 Concentrics. I think you mean 932 Concentrics. So Gavin, you reckon this could have been that front wheel?